Colourful and cheap, is Nokia Lumia 625 a winner? The Nokia Lumia 625 is the latest addition to their ever-expanding line-up of Windows Phone 8 powered devices, but can this colourful smartphone outshine its bargain price? Nokia has really made Windows Phone its own, producing numerous devices all targeted at different customers. The Nokia Lumia 625, with colourful shells, a big 4.7-inch screen and a sub-£200 price tag, is clearly aimed at the cost conscious consumer. However, features like 4G LTE support and a solid build could pit it against popular mid-range devices like the HTC One Mini and the Samsung Galaxy S4 Mini, as well as its predecessor, the Nokia Lumia 620. Nokia sure knows how to design phones, its recent slew of releases has gone from the slick aluminium rimmed Nokia Lumia 925, to the colourful, 41-megapixel camera toting Nokia Lumia 1025. The Nokia Lumia 625 continues this impressive run, pairing a sleek body, with a large screen and bright, replaceable rear-shells. Coming in vivid orange, green, white, black or yellow, this device is all about fun, yet without sacrificing build quality. Everything feels solid, especially the Polycarbonate shell, which has a lovely soft-touch, matte coating that feels great in the hand. The curved corners and slight rounded look just further improve the experience of using the phone. The Nokia Lumia 625 feels weighty in the hand, coming in at 159g, a fair bit more than both the HTC One Mini and Samsung Galaxy S4 Mini, which weigh 122g and 107g respectively. While it may seem heavy, in actual use it doesn't seem to make much of a difference, if anything the added weight helps, giving it a feeling of sturdiness. 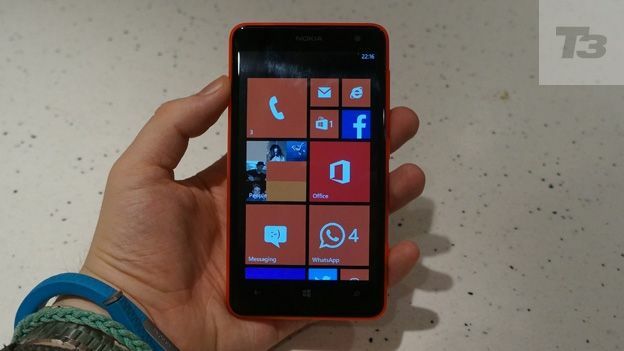 In terms of measurements the Nokia Lumia 625 is a fairly large device, hence the 133.3 x 72.3 x 9.2 mm body. Compared to some of the competition, the HTC One measures in at 132 x 63.2 x 9.25mm and the Samsung S4 Mini comes in at 124.6 x 61.3 x 8.94mm, however it is fair to note that while both of these devices carry 4.3-inch displays, the Nokia Lumia 625 goes a bit larger with a 4.7-inch screen. Running Windows Phone 8, the Nokia Lumia 625 features the colourful, live tiled fuelled experience we've grown accustomed to on the brand's recent devices. It's bright, blocky and quite a departure from the icon based layouts of Android and iOS. The main issue people have with Windows Phone 8 is the app situation. While you'll find stalwarts like Facebook, Twitter, Spotify and WhatsApp, try to find commonly used apps like Dropbox, YouTube and Vine and you'll be out of luck. However with the recent news that Instagram will finally make its way onto the operating system, hope is not lost on the app front. Office comes as standard – great for making small alterations to documents on the go, while HERE Maps and HERE Drive are installed to dampen the disappointment at the lack of Google Maps. There's 8GB of internal storage, though increasing this is easy thanks to the Micro SD slot, along with Bluetooth, Wi-Fi and an FM radio. Another top billed addition is support for 4G LTE networks, like EE, this is a great feature for such a low-priced phone. Call quality is impressive, with conversations sounding crisp and clear. The major disappointment with the Nokia Lumia 625 is the screen, and it almost lets the whole device down. While it is 4.7-inches, the same as the HTC One and Nexus 4, the resolution is severely lower at just 480 x 800 and stretched out over the large display, this is really noticeable. Colours lack oomph, text is jagged and pixels are visible throughout the majority of menus and pages. Viewing in bright sunshine is fairly poor too, with a lot of reflection coming off the Gorilla Glass 2 encased screen. The only saving grace is that Windows Phone 8 seems to deal better with lower resolutions better than its Android counterparts; this is probably due to the reliance on large, single coloured filled squares. While the screen disappoints, it has to be remembered that this is a sub-£200 device, not a £500 flagship so a 1080p display cannot be expected. It just feels like lowering the screen size would have made it slightly crisper. Taking care of snaps on the Nokia Lumia 625 is a rear facing 5 megapixel camera, paired with a VGA one on the front for video-chat and selfies - albeit blurry ones. Auto-focus and an LED light are also present, though we wouldn't recommend relying too much on the flash. The camera shutter button is also a welcome addition, letting you easily jump into the camera app. Pictures look quite good, especially outdoors when it's bright and there's plenty of light. Start shooting in poorer conditions and the snaps take a drastic turn downwards. Often coming out as nothing more than faintly black, with no clear details. One nice addition is the Nokia Smart Cam app, seen on the Nokia Lumia 925, which gives you more control over settings and a variety of shooting modes to choose from. Powering this colourful, polycarbonate clad device is a Qualcomm Snapdragon 400 Dual-core 1.2 GHz processor, combined with 512 MB RAM and an Adreno 305 GPU. This device runs impressivey well – scrolling through the home screen is smooth and there is rarely any slow-down. It seems that Windows Phone 8 is so well optimised it doesn't really need super fast quad-core processors. Only having 512MB may cause a problem in the future when it comes to compatibility with new games, however playing a quick round of Angry Birds or Fruit Ninja is perfectly acceptable. The 2000 mAh battery runs easily for a day's worth of usage, even occasionally lasting a few hours into the following day. It can take plenty of calls, app use and internet browsing without taking a massive battery hit, something rarely seen on modern day phones. It's easy to be impressed with the Nokia Lumia 625 thanks to its colourful, replaceable shells, stellar performance and great build quality. The qualms with Windows Phone 8 are still lingering, though this could easily be sorted with a few high profile app release. We can even forgive the middling, low-res screen just because the device is priced at the low-end of the market. If you're looking for a cheap, smooth running first smartphone, you can't go wrong this latest addition to the Lumia line.